Is McCain's War Record Sacrosanct? How do you make the case that a decorated war hero, a former Navy aviator who was shot down behind enemy lines and suffered more than five years' incarceration as a prisoner of war, is not well qualified to be Commander in Chief? As the Barack Obama campaign has learned, it's not easy. This week Wesley Clark, the NATO Supreme Commander under President Bill Clinton, became the latest in a series of Obama supporters to bungle the argument when he told CBS's Face the Nation, "I don't think riding in a fighter plane and getting shot down is a qualification to be President." The idea Clark was trying to communicate is that John McCain's honorable military service should be divorced and analyzed separately from his foreign policy record. Why? Because the first is unassailable, while the other is eminently flawed, says Ted Galen Carpenter, vice president for defense and foreign policy studies at the libertarian Cato Institute. McCain's war record "simply shows he was a very brave man. But it shows neither wisdom nor judgment," says Carpenter. "And when it comes to foreign affairs, it's irrelevant." But in minimizing the import of McCain's military service, Clark instead opened the door to the sort of criticism that Obama, who painstakingly praises McCain's military record at virtually every event, cannot afford. Cable-television talking heads feasted on the comments, with at least one partisan going so far as to accuse the Obama campaign of "swift-boating" McCain. The episode shows how hard it is for Obama to criticize McCain's potential as Commander in Chief without being perceived as attacking McCain's military record. "In this case, I'm not sure the American people are going to separate the two," says former Senator Bob Dole, the 1996 Republican nominee and a decorated war veteran himself. Obama "certainly has a right to criticize him on Iraq, on any issue domestic or foreign, but I think McCain's in a unique position where a lot of voters that are on the fence are going to end up with McCain because of his war record." Certainly, McCain has a perspective on war that Obama cannot claim to match. What frustrates Obama surrogates and advisers, though, is that their criticisms of McCain's foreign policy positions  from his eagerness to bomb North Korea in 1993 and again in 2002 to his hawkish position on Iran and his unwavering support for the war in Iraq  often fall on deaf ears. The Obama campaign wants "to establish the idea that McCain's military bravery does not automatically make him a good Commander in Chief," says Clyde Wilcox, a political science professor at Georgetown University. In the latest TIME poll, the only area in which McCain led Obama was national security. When asked who "would best protect the U.S. against terrorism," 53% of respondents chose McCain to just 33% for Obama. And nearly half, 48% to Obama's 38%, trusted McCain more to handle the war in Iraq, though 57% said they believed the U.S. was wrong to invade Iraq and 56% said they would like to see the troops brought home within the next two years. Overall, Obama led McCain 47% to 43% in the poll conducted June 19-25. So can Obama, who did not serve in the armed forces, do anything to turn around what so far has been a losing issue for him? His series of speeches this week focusing on his love of America confronted a trifecta of challenges for his campaign. First, he tackled criticism that he lacks the gravitas to be Commander in Chief. Second, he confronted head-on the false rumors that he is a Muslim or refuses to recite the Pledge of Allegiance. And third, his choice of venues was telling: semirural, mostly white areas where many voters have been skeptical of his candidacy. "Obama will never win rural America in the fall, but this is about margins," says Larry Sabato, director of the University of Virginia's Center for Politics. "Rural voters like to judge candidates up close and personal. The more they see of Obama, the less strange and foreign he will become. The acceptability quotient can shave a few percent off McCain's rural majorities, enabling rural people upset about the economy or Iraq or Bush to vote for Obama." However uncomfortable, Obama needs to keep pressing his case, or else Republicans will do it for him. "It's an open question whether patriotism will work as a wedge issue against Obama, but early signs are that the G.O.P. and G.O.P.-leaning 527s are betting that it will," says Stephen Schneck, a political science professor at Catholic University in Washington. At the same time, Obama's strategy of trying to separate McCain's military record from his foreign policy expertise does not appear to be working. 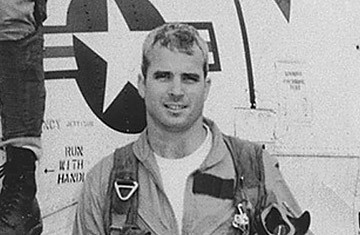 Every time an Obama surrogate mentions McCain's war record, they highlight his greatest advantage. As Dole wryly joked when asked if McCain can win in November: "Sure he can, if Wes Clark keeps helping him."